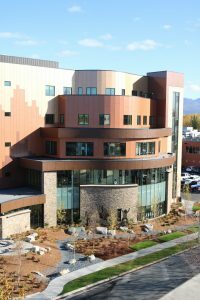 The new Dr. Katherine and Dr. Kevin Gottlieb Building (named by Resolution 1709 passed by SCF’s Board of Directors) houses the Alaska Cleft Lip and Palate program, providing children and families state-of-the-art equipment and an inviting space to collaborate with the team. On Jan. 1, the Alaska Cleft Lip and Palate Program became a designated cleft palate team by the American Cleft Palate-Craniofacial Association; the ANMC program is the only one in the state to receive this designation. ACPCA created standards for cleft palate teams across the country to ensure coordinated and consistent care for people with cleft palates and cleft lips. The ACPCA oversees the Commission on Approval of Teams that is responsible for reviewing applications across North America. Applications take about six months to process; the review includes examining the six different standards, including: team composition, management and responsibilities, patient and family communication, cultural competence, psychological and social services, and outcomes assessment. Receiving the designation allows people to be referred for services from the national association. Through the 2018 needs assessment, customer-owners expressed a need for improvement and expansion of dental services. With the new designation as a cleft palate team, customer-owners can be confident that they are receiving the best care. The CLP Program is one of the many programs now located in the new Dr. Katherine and Dr. Kevin Gottlieb building, and has the latest in dental technology. Along with the updated CLP Program space, the Dr. Katherine and Dr. Kevin Gottlieb Building expansion created more access to dental services. The new Children’s Dental Clinic does not replace the previous ANMC Dental Clinic, instead it expands the number of available dental chairs. The Children’s Dental Clinic added 32 chairs, including 12 dedicated to orthodontics, to meet the customer’s expressed desire to have access to appointments when needed. The expansions and new clinic allows the ANMC Dental Clinic to increase the number of non-pediatric appointments creating a major dental expansion for customer-owners.